We’re total number nerds here at NerdWallet! But some people aren’t quite as infatuated with math. Case in point: A study by a Boston College marketing researcher showed that telling consumers how much interest they were incurring by only making the minimum payment on their credit cards didn’t affect their payment amounts. 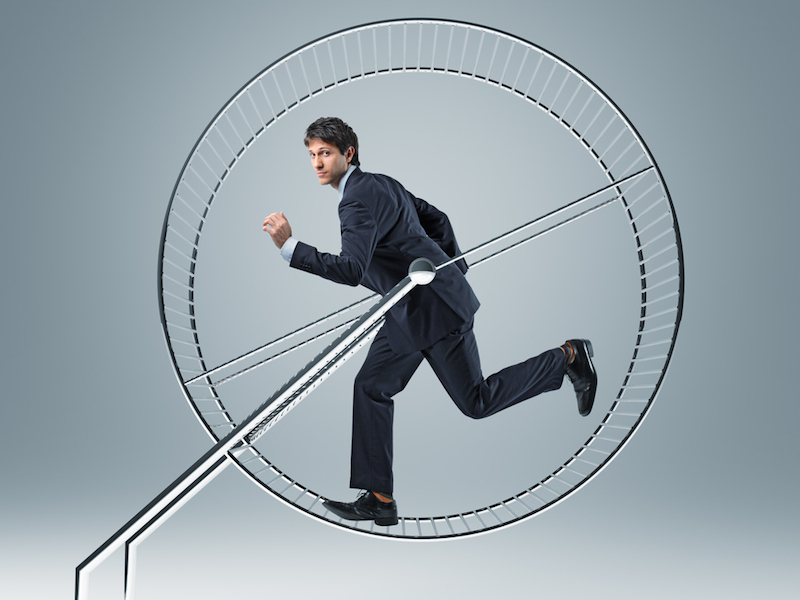 If you’re stuck in the minimum payment hamster wheel, here’s how to get off it. If you only make the minimum payment, you’ll be in credit card debt for years. Aside from accumulating interest charges, this means you’ll have to make your minimum payment each month well into the future, which keeps your monthly expenses high. Every extra expense can be a hindrance if you get into financial straits due to job loss, medical issues or any other hardship. By paying more than the minimum, you’ll reduce your future monthly expenses tied to paying down your bill. Along with higher monthly expenses, you’ll also have to keep track of your account for as long as you have it. By paying off the account faster, you’ll have one less due date to worry about. How much extra should I pay? In a perfect world, you’d pay off as much as you possibly can out of your discretionary income each month. You would increase your income and/or cut your expenses and direct your extra dollars to paying off your credit card once and for all. This is a great option that we highly recommend. However, if you don’t want to allocate that much money toward debt, there are a couple of simple increases you could make. One is doubling your minimum payment. Here’s a scenario: If you have $6,000 in credit card debt at an interest rate of 18% and your minimum payment is $120, you’ll pay it off in seven years and seven months by making only the minimum payment. But if you doubled it and made payments of $240 a month, it would be paid off in two years and seven months. That’s five years less just by doubling your payment! A second option: You could also pay your credit card off in three years by paying the three-year amount on your credit card statement. To find this, go to the “Minimum Payment Warning” section of your statement. You’ll find the amount of time it will take to pay off your card with the minimum payment and an alternative payment that will wipe out the balance in three years. By making the alternative payment, you’ll significantly reduce not only your payment timeline, but also your interest accrued. Note: You’ll only make progress on your credit card debt if you aren’t incurring new debt. When you’re in debt-payoff mode, don’t charge more to your card. Bottom line: If the extra interest accrued doesn’t persuade you to make more than the minimum payments, think of it in terms of years in debt. To shorten the amount of time you’re stuck in debt, use your excess monthly cash flow to pay it off, double your minimum payment or make the three-year payment. You’ll pay less interest, lower your future monthly expenses and limit the number of bills you have to keep track of for years to come.